As its name implies, the 'Kenny Neal Special' has been custom-built to the specifications of this great Baton Rouge, Louisiana bluesman, using a blend of traditional and Exotic woods. Kenny wanted a working man's guitar - one that is light in weight but would deliver warm, fat tones with plenty of midrange as well as low-end growl. 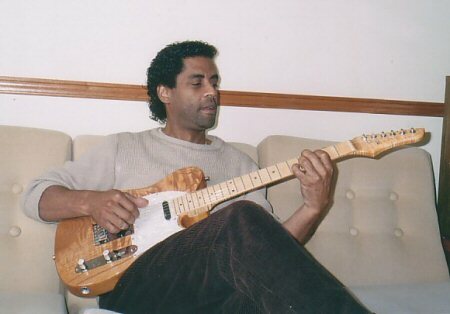 My goal was to build Kenny a first class guitar that would deliver the sweet and soulful sounds for which he is famous. Therefore, in building this special instrument, I used woods which are well known for their remarkable tonal qualities and lots of sustain. The highly figured Spanish cedar top and identical back exhibit extraordinary curls as well as flames from deep within. These features have been enhanced for maximum grain definition, making the'Kenny Neal Special' a gorgeous-looking instrument. Kenny and his son came to my place to pick up his guitar, which he played extensively, and praised me for the wood selection, my craftmanship and attention to detail, playability and overall performance of the guitar. He was very pleased with his new instrument. Two days after picking up his new guitar, Kenny phoned me to thank me again for a job well done. He told me that he had already used it to do a recording, it sounded great, and he couldn't wait to show it off. To succeed in building a fine quality instrument that has met the highest expectations of such a great and talented artist is a truly rewarding experience. In Kenny's hands, it sings sweetly! Alder body, with highly figured Spanish cedar top and back. Specially shaped flamed maple neck to suit Kenny's playing style, with a finish that brings out the natural feel of the wood. 2 EMG Single-coil Active pickups (TC Set), with EXG (EQ) Guitar Expander, powered by 9-volt battery, with plenty of warm, fat tones. Master volume, with the EXG (EQ) in place of normal tone control; 3-way pickup selector switch and stereo output jack. White pearloid pickguard, chrome control knobs with white pearl caps to match the white pearloid pickguard. Kenny's initials engraved in interlocking monogram on the chrome control plate add a personal touch. Grover Mini Locking guitar machine heads, with 18:1 gear ratio.